Separating Hyperplanes is officially reinstating Pluto as a planet, and also promoting Eris to planet status. There are at least ten planets in the solar system. You're probably aware that Pluto is no longer considered a planet, and that this change resulted largely from the advocacy of Neil Degrasse Tyson. Now, I'm a big fan of Tyson, but on this issue he screwed up big time. Let me be clear about something. I'm not particularly fond of Pluto. 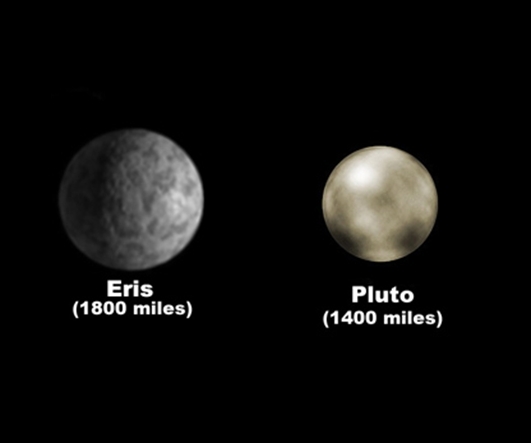 And, I understand why Tyson argued it should not be considered a planet: there are, in fact, non-planets in orbit around the sun that are bigger in size than Pluto, so any definition of a planet must necessarily either exclude pluto or include Eris. Now, few things in the world could matter less than what we call a rock orbiting the Sun. Planet, Planetoid, Dwarf Planet--these are all suitable titles. You could even call them Gods. Or we can call them Wanderers. It really doesn't matter at all what we call them. So given the option between calling Eris a planet versus demoting Pluto to not-a-planet, why in the solar system did Tyson pick the latter? Here we had the opportunity to christen a new tenth planet beyond the orbit of Pluto, and reap the benefits of all the interest in the sciences that such a "discovery" would have generated in the media. Anouncing a tenth planet in the solar system could have inspired many to take up astronomy and become scientists. It would have been the nudge that rich people needed to direct some philanthropy at the sciences. It would have pressured Congress to renew funding for NASA. But no. Instead we decided to squander those opportunities in order to keep our meaningless label "Planet" slightly more exclusive.